PIC Microcontroller Handheld Programmers for production and field updates. Ideal for standalone PIC microcontroller programming in production or for PIC firmware updates. 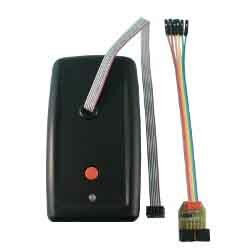 These programmers are available on their own or with PC USB loaders as complete starter kits. 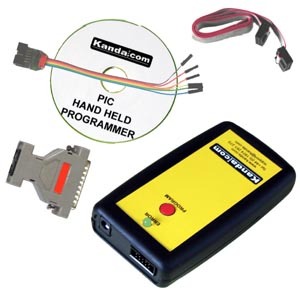 Adapter for converting target interface of PIC hand held and keyfob programmers into an RJ11 connection. This connection type is used by Microchip ICD2. Adapter for end of the 10-way programming lead that converts to 6-way SIL (Single In Line) connector. The pin-out of this 6-way SIL matches PICkit3 output. Adapter for end of the 10-way programming lead that converts to 5-way SIL (Single In Line) connector. The pin-out of this 5-way SIL matches PICkit3 output.